Grand Expo and Conference on Alternative and Innovative Construction Technologies A Grand Expo and Conference will be organized biennially (once every two years) in India to provide a platform to all stakeholders associated with housing construction. The event will have panel discussions, inspiring talks, exhibition of prototypes, the exchange of knowledge and business, provide networking opportunities and the signing of MoUs. The first Expo and conference is proposed to be held on 2nd and 3rd March 2019 and is expected to be attended by a wide range of stakeholders such as technology providers, researchers, builders, developers, entrepreneurs, academia, civil society organisations, and public-sector agencies such as housing boards and public works offices. 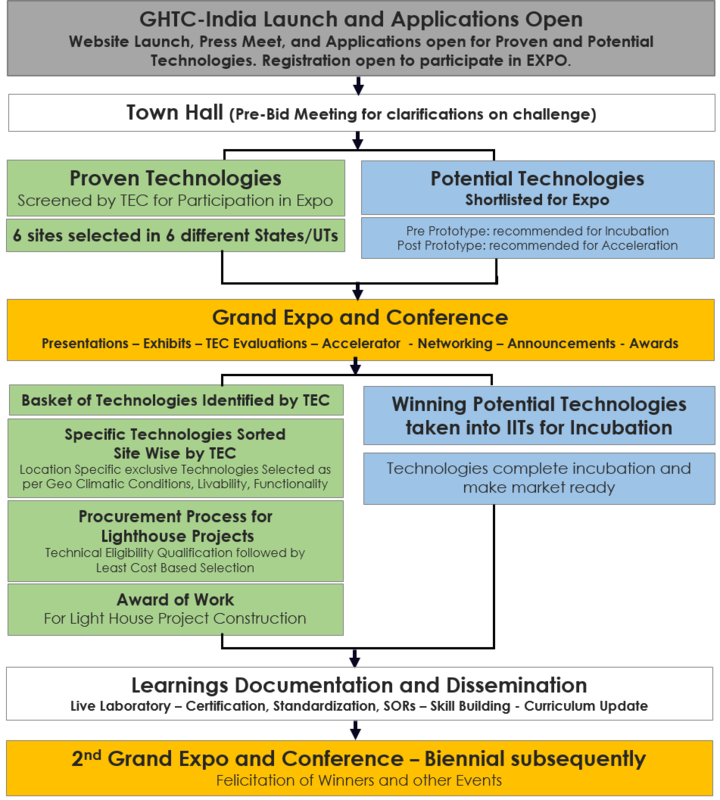 Identifying and Mainstreaming Proven Demonstrable Technologies for the Construction of Lighthouse Projects Proven Technologies that are innovative and established are to be identified and mainstreamed from around the world for use in the Indian context. Such technologies will be invited to apply through a global online Express of Interest (EoI), which in turn will be rigorously screened by an eminent Technical Evaluation Committee constituted at the Ministry of Housing and Urban Affairs. Suitability for the different regions of India will be established, and these technologies will be further invited to design and build lighthouse projects of approximately 1,000 housing units each at six places in the country. These projects will demonstrate the merits of the selected technologies and serve as live laboratories for research, testing, technology transfer, increasing mass awareness and for mainstreaming them in the country. Identifying Potential Future Technologies for Incubation and Acceleration Support through ASHA - India (Affordable Sustainable Housing Accelerators) Potential Future Technologies from India that are applicable to the housing sector will be supported and encouraged through the ASHA India program. It will invite applications from local researchers and technology developers whose products are not yet market ready or are market ready and are yet to achieve scale. Promising solutions will be identified by an eminent Technical Evaluation Committee for Incubation and Acceleration support. Four eminent IITs will provide incubational facilities and support such as product development, mentoring and monitoring, prototyping, company incorporation, patent guidance and business model assistance. Accelerator workshops will be organised by leading institutions to enable a better eco-system familiarity for start-ups through master classes with funders, industry leaders, and sector experts. At least one accelerator workshop will be organized each year.